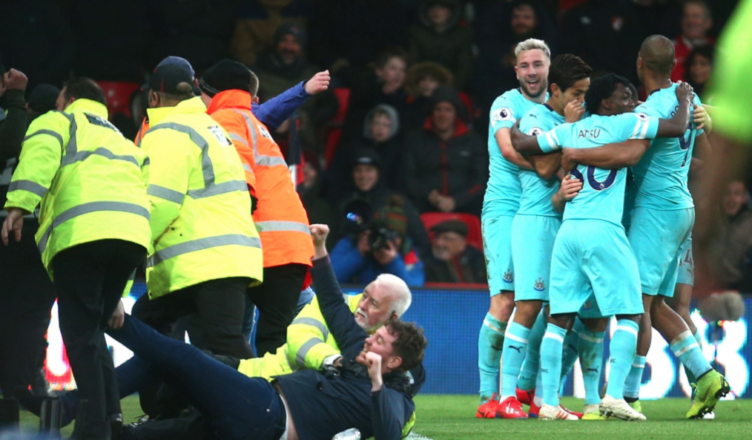 Bournemouth 2-2 Newcastle: Last minute stunner rescues deserved point – NUFC blog – Newcastle United blog – NUFC Fixtures, News and Forum. 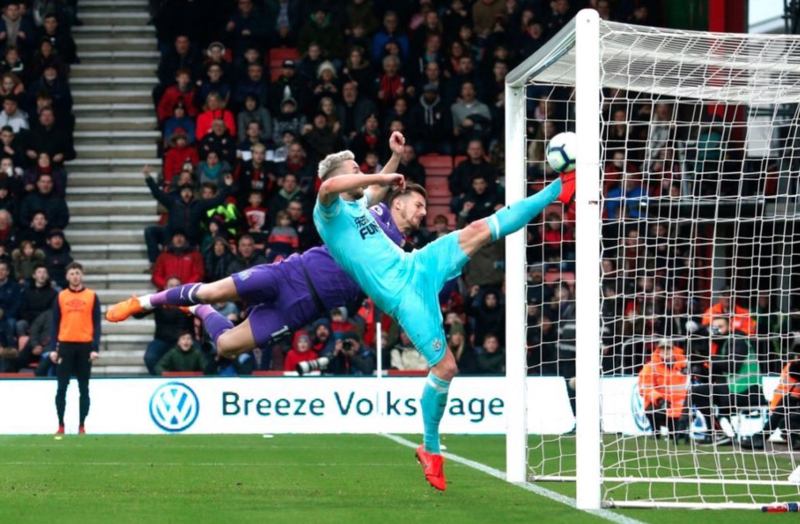 It wasn’t pretty at times, with the wind swirling around on the south-coast, but it was a game we deserved something from – and a late Matt Ritchie strike gave us exactly that. On reflection, it was a game Rafa may be frustrated not to have won given we went in at the break 0-1 up, courtesy of a perfectly placed free kick from Rondon (his 10th goal of the season), but it’s a great point in the end. Elsewhere there was only two other games today, with Burnley in the last minute at home to Leicester and Huddersfield surrendering a 3-1 lead to lose 4-3 at West Ham. A good point and one that takes us into the international break 7 points clear (practically 8 with goal difference factored in) of Cardiff in third bottom. Sidekick: Cardiff are fcked mate. They have Man City, Burnley and Brighton all away followed by Liverpool at home. They are 5 points behind Burnley and Brighton so really need a win there. I can’t see it. That means we are safe which is the main thing. Liverpool ahead. Only the new stadium to celebrate for Spurs this year then. Wonder if there will be 40,000 Mackems at these games? DT: How did you manage to get the LDV Vans trophy game in Dubai? I don’t really mind Spurs that much but their fans are w@nkers. Visited my brother in Thailand last year and his girlfriend’s cousin was there. He wore Spurs tops for the whole 2 week trip. Must have had 5 of them because it gets hot there, like. Anyway, sang “10 German bombers” every night when he got drunk. Also, we were in a bar when Spurs were playing and he wouldn’t watch the game. Too scared he said. Spurs went up 3 nil and I said, Barry, you are up 3 nil why aren’t you watching. Then, suddenly, he was a massive Spurs fan again and singing and chanting. DT: it used to be called the LDV Vans Trophy. Pards won it for Palace or some other team. Oh ok, didn’t know that mate … actually it was quite a good game. Quite dramatic at the end. So it will be Rafa and NUFC to deny Liverpool the title on the 2nd to last weekend. A Ref/Linesman decision has pretty much relegated Cardiff. They would have gone down anyway but I don’t blame Colin W@nker for being upset. Yeah Warnock taking a bit of stick this morning for overreacting, but they were robbed of 2 penalties, a Chelsea defender being sent off and Chelsea scoring a blatant offside goal. Win that game and they were only 2 points off Burnley – but now they are 5 off and the fat lady is getting ready to sing. If managers come out and have a go at refs after a game, they get fined, but refs and linesmen seem to just get away with making bad mistakes – mistakes that cost millions. Managers and players have media commitments straight after a game. For me, refs should have to explain these decisions as well. They write that Warnocks reaction encourages hatred towards refs – bored of hearing this hatred $hite now. But it’s the FA protecting the refs that encourage bad feeling towards them – mistakes with no consequences will always pi$$ people off. Sharpy, it doesn’t help that there seems to be big team bias as well mate. Cannot wait for VAR but suspect they’ll find a way to mess that up too. Kim – it definitely feels that way sometimes. I think everyone accepts that they have a difficult job and there will be tight calls they get wrong. But the ref was 10yrds away and looking directly at the 2 penalty shouts – and the Chelsea goal was 2 yards offside – with 2 players off. If those ones need VAR, those officials shouldn’t be in the PL imo. I think we could get something tonight. I’m hoping they have gone off the boil a little bit after the international break, but then Spurs dropping points yesterday might get them going. This isn’t one I expect anything from though, but if we could get a point I think that’s us safe after Cardiff lost yesterday. And Warnock had a right to be annoyed. He is a 70 year old man and there were 25 men (3 officials and 22 players) on his lawn. He should have called the council or written to his MP. Or written to the Daily Mail but they are only taking letters about Spurs’ new stadium at the minute. FINALLY logged back into the blog now and able to write article so will get the Arsenal preview and new thread out soon. Later than planned, but here’s the Arsenal preview folks! Their recent record at home is surprisingly impressive..